For those seeking a little more embellishment on their leather belts, Gavere Leather offers some belts with a unique painted finish. All painted belts are 1 ½” wide and feature high relief designs that have a layer of paint applied to them. These tooled leather belts are painted prior to undergoing our exclusive sixteen-step finishing process, so you never have to worry about the paint job fading or chipping. 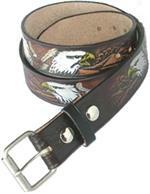 Our painted leather belts are made from 100% heavy duty top grain tooling leather. If you are looking for unique embossed leather belts, look no further than the selection of belts at Gavere Leather. All of our top grain leather belts are made in High Springs, Florida. That means you’re getting a quality American made product. Don’t settle for less than the best quality and craftsmanship available. Let Gavere Leather make you a belt that you’ll be proud to show off. Every belt comes with a standard utility belt buckle, a leather keeper, and special snaps so you can easily switch out your belt buckles. In addition to the standard buckle, you can also get personalized belt buckles for men and women. For information about how to properly measure for a new belt, please read our How to Measure Guide.